Let me show you the progression, six years after we planted our Cherry tree. 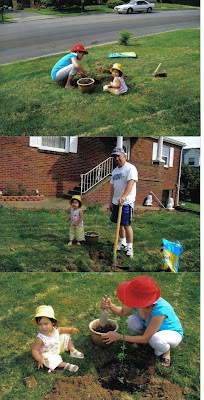 We planted this tree when Ms. Burrito was just 2 years old. This is a tree we dedicate for her, one of the many reasons why I don't really want to leave this home that we are currently living in. My husband is really pushing for us to get a new home because this is getting small for the four of us. As you can see in the first photo, the tree is just a twig. We bought it online and we let Ms. Burrito helped us in planting it. She was the one who put the twig in the hole. On the second photo, it was taken when we came back from Korea. This year, 6 years after we planted it, the tree finally bloomed but only few of the branches has flowers. Maybe next year, it would bloom in full (that is, if we still live here). Not from our tree but in downtown. The only Spring flower I have in my garden, the Irises and daffodils did not bloom at all. I hope you are all having a great weekend. We will be heading out to go to Tomlinson Run Park, take the opportunity of sunny weather because tomorrow, it will be rainy again. The tree will always be a loving memory of your beautiful daughter - even when you move. It is a tribute to her beauty! Cherry Trees are my favourite, they are just so spectacular. We live at 'Cherry Tree Cottage' and as yet have never had any look growing them ! Cherry trees are so beautiful and smell spectacular! I am sure you will miss it--why not plant another one whereever you move. I love seeing the difference a few years make. It is really beautiful. What a unique way to mark the growth of the tree and your daughter. I love it!! wow! amazing, look at how beautiful that tree is and that fact that you grow it and it's getting big now. oh, my! how exciting....penge pag may bunga na...ehehee! awww i wouldnt want to leave either! The tree is beautiful like your daughter. I love to see how much trees change over time (just like our kids!). And to think, the tree is still just a baby. It would be neat if you can come back to it many years down the road and get another picture. Awww..the tree is so big now just like your daughter. and of course know the reason why that is very sentimental....even i would never want to leave the place. They have both grown, love those branching arms of Ms Burrito. If you move at least you have seen it flower. A pretty tree. It may bloom whether you are there or not ; it'll be your family legacy. What a beautiful tree. The reason why you plant the tree was very important especially for Ms. Burrito. It is so good to see that the tree grew up with her and continuously standing despite the changing weather. How time flies nga. Sayang naman if you move into a new home. My sentimental value ang Cherry tree sa daughter mo. Sama nyo kayang ilipat. Cherry tree is so pretty! But the act of letting it grow is prettier. Oh! Wow. The cherry tree has grown. And,it's showing pretty blossoms. Same thing as the one who planted it -Miss Burrito is growing fast and becoming even more beautiful. It's amazing to know that the cherry tree has grown now, and has blossomed. Life is a miracle indeed. wow bunso pala to ni ms burrito...i wish to see cherry tree someday..malay natin..di ba? happy monday! electioon day pala ngayon dito..
How time flies so quick, Rose! Baby palang si Rye nong tinanim at kita mo naman ngayon, dalaginding na!